This document explains how to get a mapped network drive to work within a Windows Agent job. You can use the net use command from within an agent job or add it to an agent environment to use with multiple jobs. If you are running multiple agent jobs on a Windows server with a mapped drive, we recommend that you create an Agent Environment and use it within your agent jobs. 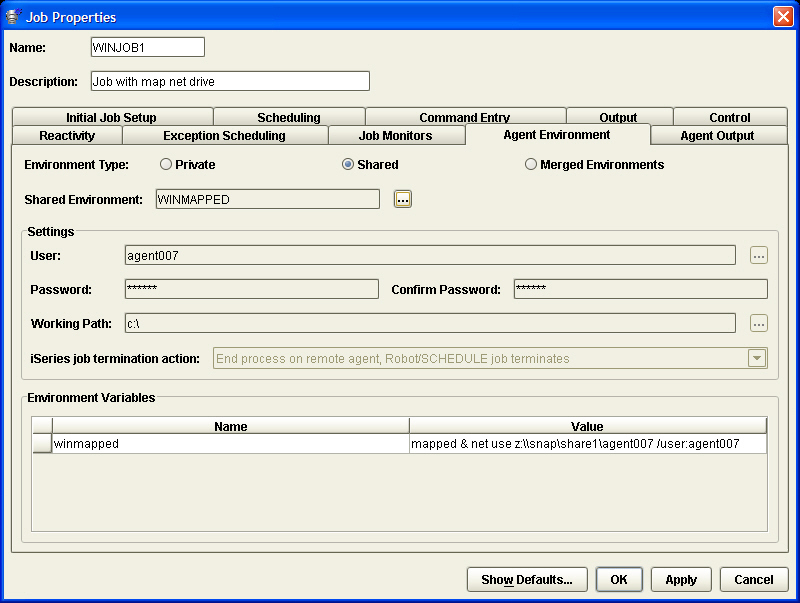 Create a new Agent Environment Variable using the Robot Schedule Explorer. On the Properties window, enter the Name, Description, User, Password, Confirm Password, and Working Path that will be used for the signon and the working path. The word 'mapped' in the net use command is not important. It just allows you to use the 'net use' command. You must enter your Windows server username and password in the job command in plain text (or use a reserved command variable). After the Agent Job runs, that information is visible in the Agent job spooled file. For the duration of that Agent Job, the mapping of the z: drive is valid. From the Agent Environment Properties window, click Add to create a new Environment Variable. 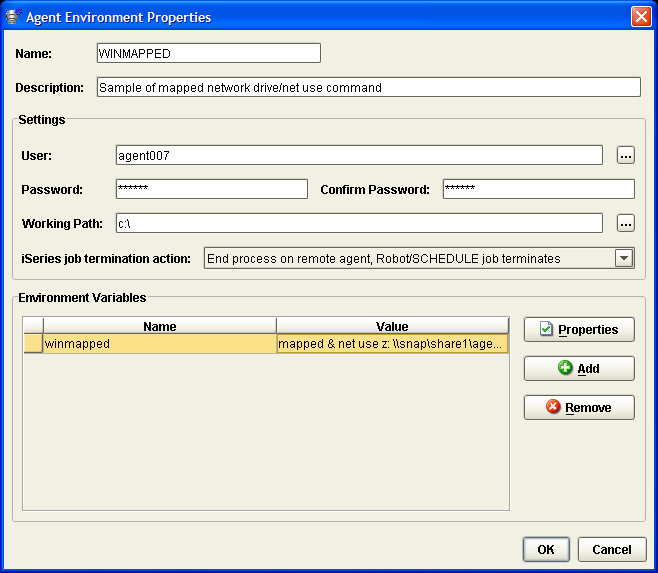 The Agent Environment Variable Properties window displays. Set the name and net use command. Once your agent environment is created, you must connect your agent job to it to use the net use command. Do this from the Agent Environment tab of the job’s Job Properties panel. Select Shared as the Environment Type. Click the prompt button (...) to select the WINMAPPED Environment. 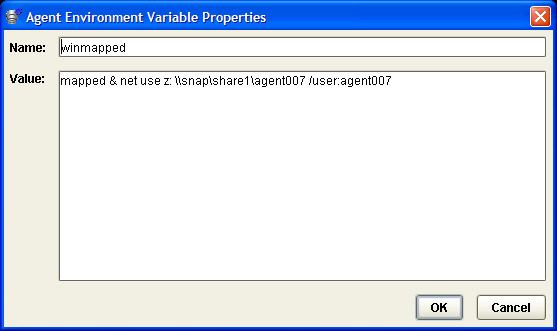 The fields are populated automatically when you select the shared agent environment. This prevents the shared drive’s server from using all of its allowed connections. This can happen if many Agent Jobs using this Environment run in a short period of time. Use the following procedure to test if your new Agent Environment is connecting to the mapped drive. The first command changes to the z: drive (the mapped drive). The second command runs the testfile.bat file that you created on your z: drive. The third command exits the z: drive so the mapping can be removed. The fourth command ends the mapped drive. If successful, the Agent Log file shows how it executed the commands on the mapped drive (showing the time).